Emilio Zarate, class of 2012, intercepts the ball from Harber Elizalde, junior business major, while Isaac Bahena, senior kinesiology major (far left) and Rick Fierro, junior business major (center), look on. 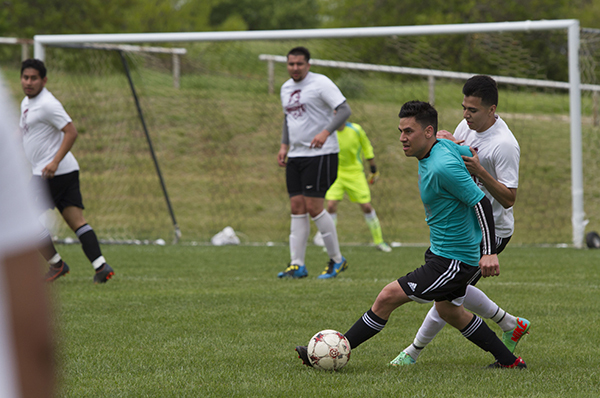 Southwestern’s first annual alumni soccer game took place on Sunday, April 13. Alumni from Southwestern Adventist University had the opportunity to play a soccer match against current Southwestern students. Recent and past alumni saw the event as a great way for past and current students to get together and share their college memories, while also having some fun on the soccer field. The game drew a very big crowd, as alumni and current students cheered on their team. After an intense first half, the Knights led 5-3. At half time, both teams went to midfield for a memorable team picture. After a quick water break and pep talk, it was time for the second half to begin. Although the Alumni created many scoring chances in the second half, it wasn’t enough, as the Knights won the game 7-3. Players from both teams got together at halftime for a photo.